Apple juice comes from organic farming and has a BIO Certificate No. PL-EKO-07-04494. The juice is formed by pressing apples on the press. This product is a 100% natural. Not from concentrate. 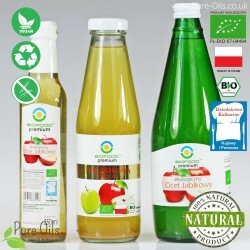 Apple-Celeriac Juice comes from organic farming and has a BIO Certificate No. PL-EKO-07-04494. It is a 100% natural product. The juice is formed by pressing apples and celery. Not from concentrate. 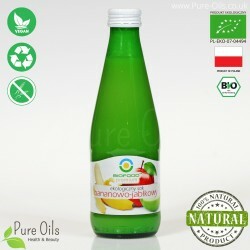 Banana-apple juice comes from organic farming and has a BIO Certificate No. PL-EKO-07-04494. It is a 100% natural product. The juice is formed by pressing apples and bananas. Not from concentrate. Beetroot and Celery Juice – Lactic Acid Fermented, Organic is a 100% natural product that comes from organic farming. Perfectly strengthens the body and supports digestion. Product has a Certificate of BIO No. PL-EKO-07-04494. 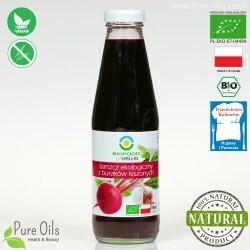 Beetroot Juice – Lactic Acid Fermented, Organic is a 100% natural product that comes from organic farming. Perfectly supports metabolism, strengthens bones as well as improves the condition of the skin and hair. This product has a Certificate of BIO No. PL-EKO-07-04494. Beetroot soup is a 100% natural product. It comes from organic farming and has a BIO Certificate No. PL-EKO-07-04494. Perfectly supports metabolism as well as strengthens bones. Birch Juice is obtained from the birch stem. This product is a 100% natural that comes from organic farming and has a BIO Certificate No. PL-EKO-07-04494. Not from concentrate. Juice can be consumed by vegan. 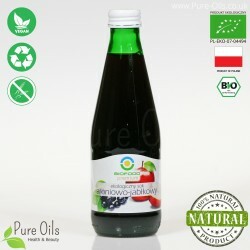 Blackcurrant-Apple Juice comes from organic farming and has a BIO Certificate No. PL-EKO-07-04494. It is a 100% natural product. The juice is formed by pressing apples and blackcurrants. Not from concentrate. Broccoli Juice – Lactic Acid Fermented, Organic is a 100% natural product that comes from organic farming. This juice is a rich source of active substances that support the fight against allergies and stomach ulcers. This product has a Certificate of BIO No. PL-EKO-07-04494. Celery Juice – Lactic Acid Fermented, Organic is a 100% natural product. It is recommended for urinary and digestive problems. This juice is a source of flavonoids and easy absorbing minerals and vitamins. The product comes from organic farming and has a Certificate of BIO No. PL-EKO-07-04494. Chokeberry Juice comes from organic farming and has a BIO Certificate No. PL-EKO-07-04494. The juice is formed by pressing chokeberry. This product is a 100% natural. Not from concentrate. Chokeberry juice can be consumed by vegan. 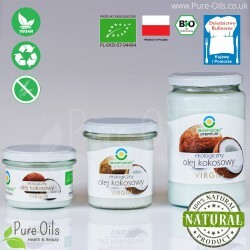 Organic coconut oil - virgin is a 100% natural cold pressed product. It contains very large amounts of unsaturated fatty acids resistant to oxidation at high temperatures. It is the basic element of a healthy diet. It has a BIO Certificate No. PL-EKO-07-04494. Cranberry Juice comes from organic farming and has a BIO Certificate No. PL-EKO-07-04494. The juice is formed by pressing cranberries. This product is a 100% natural. Not from concentrate. Cranberry juice can be consumed by vegan. 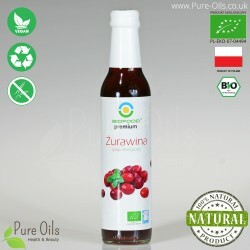 Cranberry syrup is a 100% natural product obtained from organic cranberry juice. The syrup comes from organic farming and it has the BIO Certificate No. PL-EKO-07-04494. Cranberry fruits are a rich source of vitamin C (15mg / 100g). Not from concentrate. 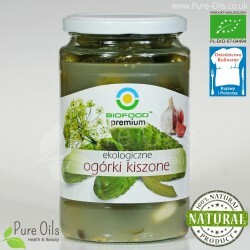 Lacto-fermented cucumber in brine is a 100% natural product. They are obtained from fresh organic cucumbers subjected to a natural fermentation process. The product comes from organic farming and has a BIO Certificate No. PL-EKO-07-04494.